You can start training the ladder against a wall to keep the dog from walking off the side. The dog should be on a short leash or tab. With the leash in one hand, the handler guides the dog to enter the ladder by showing him food with the other hand. The handler must bend over with the food held just above the rungs of the ladder so that the dog can see where it is walking and it isn't just lunging after the food. 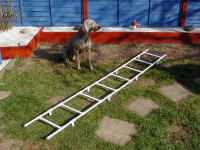 It is important to keep the treat moving down the center of the ladder to keep the dog going in a straight line. The dog will not like stepping on the rungs or sides and will quickly learn that it can control where it places its feet. The dog gets the treat after walking through the ladder. Turn around and switch hands so that the dog is now on the other side and go through again. Increase the pace as the dog gets comfortable. Then move the ladder away from the wall and start over. Progress as rapidly as the dog learns to walk through the ladder without side stepping, squirming, or jumping. Some dogs may need to be coaxed more than others. Some may not even like to stand still with their feet in between the rungs at first. This simple exercise will help the dog learn to be more confident on the dogwalk, seesaw, or anywhere it must use all four feet quickly and accurately.